All this is to say that even my stocking is a thrill to open come Christmas morning. 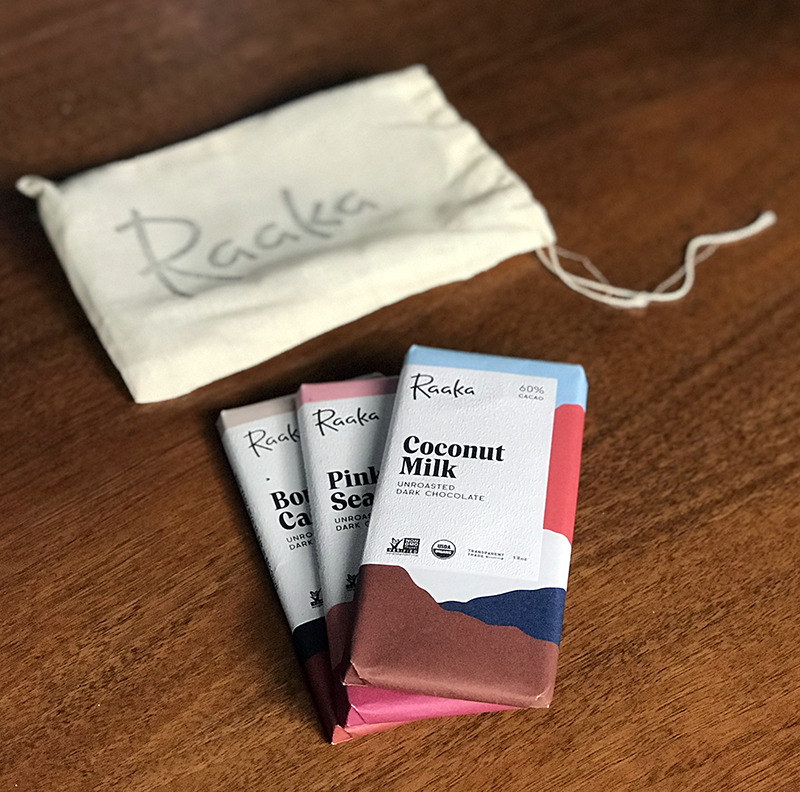 This year, along with some other lovely stocking stuffers, Steven included three chocolate bars from Raaka, an ethical chocolatier that produces some truly wonderful vegan chocolate bars. The gift ticked all the boxes for me, a lover of high-quality dark chocolate who tries to support small companies that incorporate transparent, ethical practices in their supply chain. I hadn’t heard of the brand before I received Steven’s gift, but I was glad to learn about them. 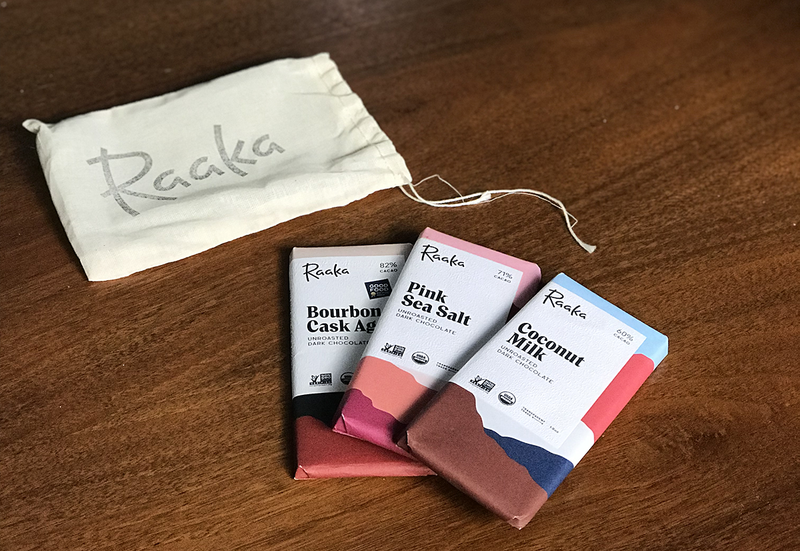 Raaka differentiates itself from other chocolatiers by focusing on single-origin unroasted beans and by being truly transparent about their processes. I received three bars, which came packaged in a nice little muslin bag I’ll happily use to stash toiletries during my travels. Here are the bars I tried. Spoiler: I love them all. Raaka describes this bar as their “tuxedoed sophisticate,” and they’re not wrong. The company barrel-ages their single-origin cacao in bourbon casks, imbuing the chocolate with a deep, rich, complex flavor. Would I have described this chocolate as bourbon-infused had I not read the label? Probably not. Is it still delicious? Yes, it is. I am fully here for the trend of sprinkling salt atop an otherwise sweet chocolate! This bar fulfills all my salty-sweet dreams, with a grains of sharp pink salt liberally dashed onto a 71% cacao bar of chocolate. It’s utterly delightful. This is easily the best vegan chocolate I’ve had in a long, long time. It hits a perfect balance between milk and dark chocolate, melting on the tongue like a milk but with the complex flavors of a dark, and very little actual coconut flavor. It’s light and smooth, a creamy delight that goes down easy. I’m exercising restraint and making this bar last as long as I can! If you can’t tell, I’m officially a Raaka convert. This is quality chocolate prepared with love and respect. I’m not sure that I’d identify it as unroasted if I didn’t know it in advance, but whatever they’re doing, they’re doing right. Plus, the labels are pleasing to look at and the price is comparable with other artisanal chocolate bars (which is admittedly steep). It’s chocolate to be savored, eaten slowly a square at a time. My kind of chocolate. Raaka has quite a few other flavors, and I’m looking forward to trying them. I love the idea of the cab sauv bar, and they just introduced an oat milk bar (!?!) that sounds really interesting. but you can make anything you want with chocolate! This VeganMoFo, I tell ya. I’ll be honest: I’m a little disappointed that I haven’t been able to share as many brand-new original recipes as I’d have liked. Chalk it up to a few factors — being on vacation during the first few days of the month; being busy with freelance work; various recipes failing on the first try — but there it is. Today, another sob story: I wanted to share a recipe for a super chocolaty banana soft serve, but alas, my bananas did not cooperate. They were either too ripe (like, I put them in the freezer when they were black and smooshy and now their only possible use is for banana bread) or too unripe (I refuse — REFUSE — to eat bananas when any green is showing on the stem). Then I got sick! It’s a minor cold, but I am not up to the triple threat that is preparing a post for a new recipe (cooking the food and documenting the recipe; staging and photographing the food; editing the photos of the food). So, instead, please accept this chocolate recipe round-up — and my sincere apologies for not giving you more. Luckily I’ve already made and shot the recipe for tomorrow, so at least I’ll have something new to share then! In the meantime… CHOCOLATE. 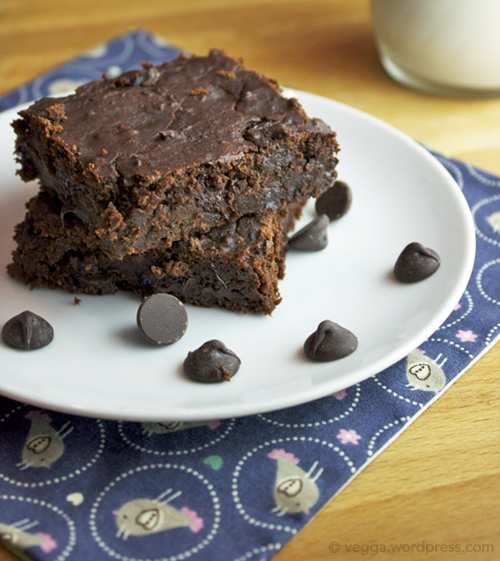 These are my current favorite brownies, featuring aquafaba! These also look gooey and incredible. For the gluten-free crowd, these look like a solid choice. And here’s another fudgy-as-f*ck option. I humbly submit my own black bean brownies. Isa’s fantastic Mexican hot chocolate snickerdoodles. I haven’t made these in a while, but they’re always amazing. Chocolate peppermint crinkles — perfect for the holidays! The ultimate vegan chocolate cake. A chocolate-soaked chocolate almond espresso cake. A super-rich flourless fudge cake. How about chocolate mousse with caramel sauce? Extremely creamy, rich chocolate ice cream. For a slightly lighter option, dark chocolate sorbet. Cocoa and cinnamon hot chocolate (I’d use cocoa powder instead of cacao, personally). A super creamy double chocolate chip frappuccino. KINDER BUENO BARS, veganized. I really, really need to make these. 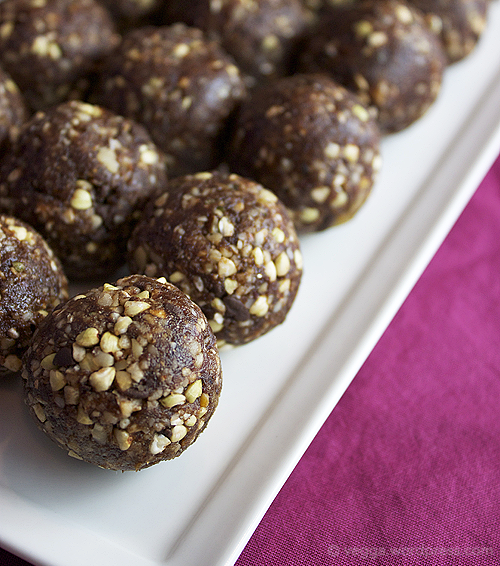 Five-ingredient salted caramel peanut butter truffles. Chocolate-topped buttercrunch toffee. Yes, please. Last year for Christmas, my parents put bags of teff flour in the kids’ stockings. (Has that sentence ever been written before?!) I’d ask a leading question like, “What do you think it says about us that we were thrilled?” but I suspect many of my readers would be equally excited to receive a new ingredient as a present! I loved everything about this gift, from the thought behind it to the product’s packaging. Truth be told, though, I haven’t used it till now. I wanted to do it justice, y’know? I figured I should make injera, but I wanted to do that only if I were making a big Ethiopian feast, and that just hasn’t happened yet. But as I rummaged through my pantry in search of nutritional superstars in disguise, I noticed that a quarter cup of teff flour has 20% of your daily value of iron, 8% of our RDV of calcium, 24% of your RDV of iron, and a cool 5 grams of protein. Needless to say, I had to try it, and I wondered how it would fare in a baked good. The answer? Really, really well. 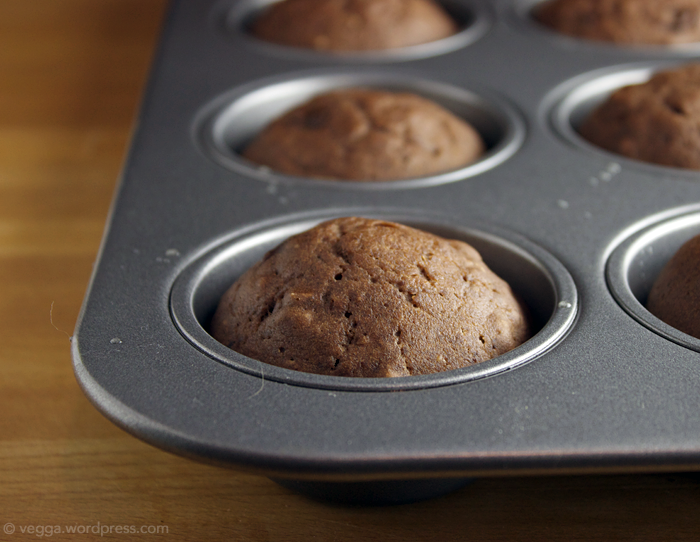 Preheat the oven to 350˚ and prepare a muffin tin using liners or a light spray of oil. In a large mixing bowl, sift together the first seven dry ingredients (teff flour through cinnamon). Stir to combine, then add the oats. In a small bowl, whisk together the wet ingredients and the sugar. Make a well in the center of the dry ingredients and add the wet. Using a plastic spatula or a wooden spoon, stir gently to combine, but don’t overmix. The batter will be very smooth, almost silky. Fold in the chocolate chips, then add the batter to the prepared muffin tin with a spoon. Fill each well about 3/4 of the way. Bake for 15-17 minutes, or until a toothpick inserted in the center of a muffin comes out clean. Remove from oven and let cool for at least five minutes before eating. 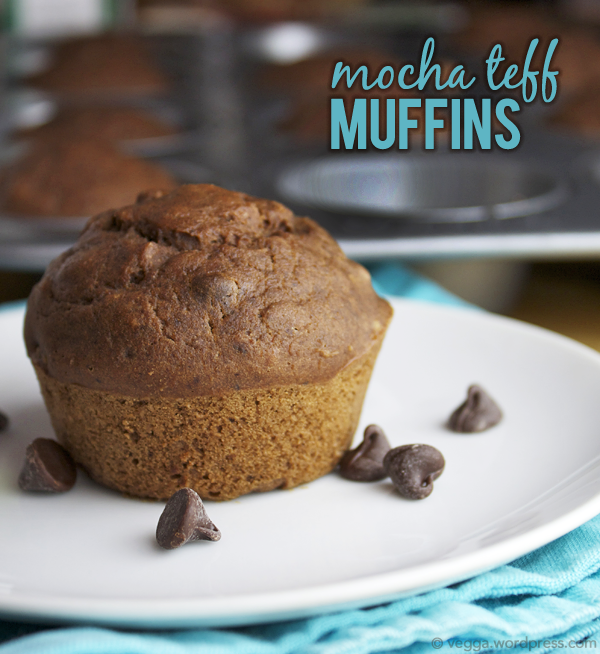 I’m enchanted with teff flour! The grain itself is teeny-tiny, and the flour is incredibly fine. It makes a silky-smooth batter that mixes with nearly no trouble, and the baked muffin has a light, delicate crumb. I’m itching to bake with it again already! And the nutritional stats of these not-too-sweet muffins? If you eat two (and you will), you’ll get 22% of your RDV of iron, 7% of your RDV of calcium, about 7 grams of protein, and a respectable helping of fiber. Have you cooked with teff flour? It’s probably impossible to write anything about chia seeds that hasn’t been said before—all the jokes have been made, y’know? And I think we’ve moved beyond regarding chia seeds as a novelty. They’re firmly ensconced in the arsenal of cooks who enjoy experimenting with their gelatinous properties and appreciate their nutritional profile. Three tablespoons offer 20% of your recommended daily value of calcium, 15% of your daily value of iron, and 5 g of protein, along with a substantial amount of fiber. I personally go through phases with chia seeds. I’ll be all into them for a month, then have a pudding or overnight oat bowl that’s just too gelatinous, and then I’ll be over them. 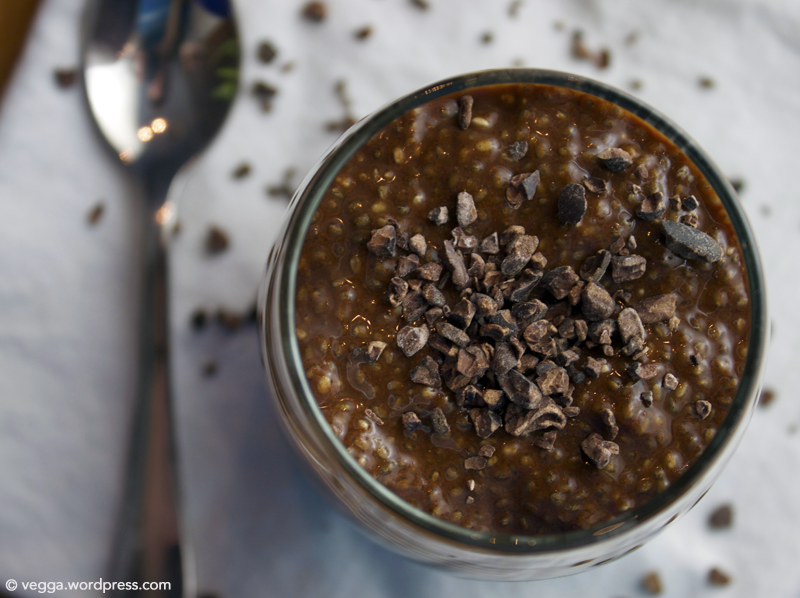 But with this vibrantly flavored Chocolate-Orange Chia Pudding, I’m back in the chia game. Add all ingredients to a jar or container with an airtight lid and shake vigorously for at least 15 seconds. Refrigerate for at least 30 minutes or until the pudding reaches desired consistency. Add any toppings and enjoy! Although the three tablespoons of chia seeds carry the main nutritional heft in this pudding, the two tablespoons of maple syrup add a surprising 8% of your daily value of calcium. That’s a total of 28% of your daily value of calcium in a single serving of pudding. Not bad for dessert! 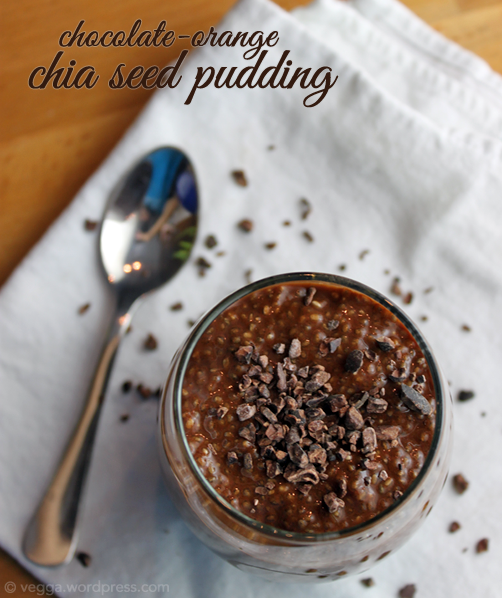 What’s your favorite chia seed recipe? 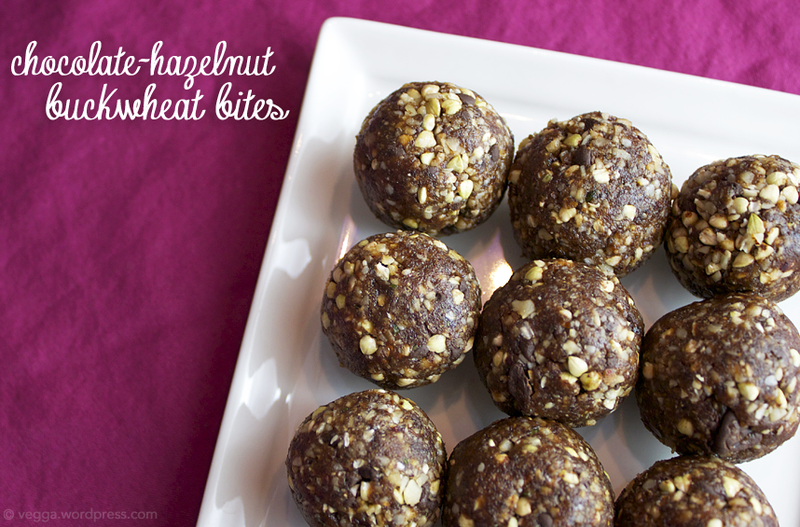 In just a couple days, S and I devoured all the Apricot Buckwheat Bites I made earlier this week. I’m surprised they lasted longer than a day, to be honest! A chocolate version. Once the idea was in my head, it wouldn’t leave. I had to make it happen. Add the hazelnuts, buckwheat groats, the hemp seeds, and about 15 dates to a food processor and process until well combined. Add the chocolate chips, maple syrup, and sea salt and process for 10-15 seconds. Check the mixture—if it’s not holding together at all, add a few dates, process, and check again. Add more dates if necessary until the mixture is sticky but holds together. Using your hands, roll the mixture into balls about 1.25″ in diameter. Store in the refrigerator for best results. Between the chocolate chips and the crunchy buckwheat, these little bites taste more like candy than anything else. But five balls give you 20% of your daily value of iron, along with 9 grams of protein, 7% of your daily value of calcium, and a decent dose of fiber. Sweet! After last week’s discussion of sickness, why don’t we talk about something sweet? Or maybe even many sweet things? Sounds good, right? I agree. This past Christmas, a few sweet people gave me more than a few sweet gifts. I’m not embarrassed to admit that my immediate family still does the Christmas stocking thing. We like our traditions! And I think my mom likes pretending that we’re still kids. I don’t mind, either, especially not this year when she filled my stocking with a preponderence of delicious vegan treats. Although some of them fell squarely in the savory camp (roasted seaweed snacks! ), the majority were sweet – Jocolat bars and dried fruit leather, for example. 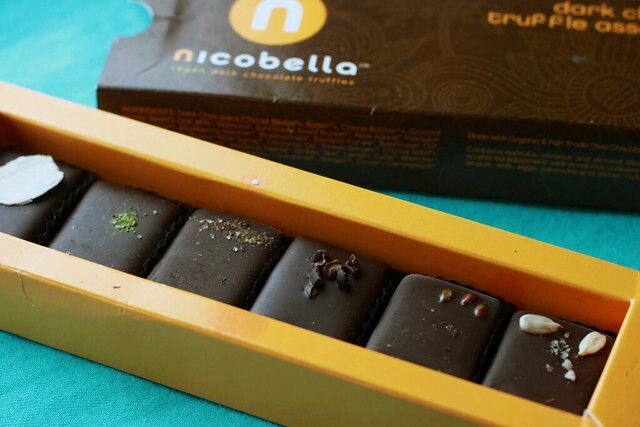 Perhaps the most exciting sweet treat was a six-piece box of Nicobella truffles. Aren’t they just gorgeous, all nestled into that pretty orange box? And the flavors were equally inspiring: blueberry almond, ginger green tea, pumpkin chai, pure cocoa bliss, walnut flaxseed, and sunflower butter banana. I savored these slowly over the course of a week or two, proving that my self-control has grown in leaps and bounds in the past few years. ;) I think the pumpkin chai was my favorite, but plain ol’ pure cocoa bliss was up there, too. A few of the flavors had a little bit of grittiness to the chocolate centers, but it wasn’t overwhelming or unpleasant. I’d love to try some other Nicobella varieties, especially their peanut butter squares! 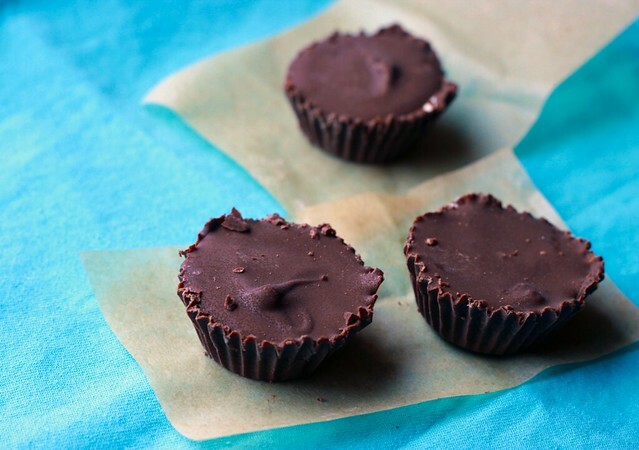 I’m a sucker for all things peanut butter + chocolate, and these are sweetened with my beloved maple syrup. Luckily for me, my Christmas haul included a peanut butter-y, chocolate-y treat. S gave me a whole box of homemade peanut butter cups! These were just as delicious as they look. If only S would make me treats more often! If that’s too time-consuming, I’d settle for some store-bought goods. S’s mom gave me (among other things) three Go Max Go candy bars. I joked that she’s my official Go Max Go dealer – the only other time I’ve eaten them was when she gave me a few for Christmas last year! I hope it’s a tradition that continues, because they’re the nearest equivalent to candy bars of yore that I’ve found. Although I can rarely eat an entire bar without getting sugar overload these days, sometimes you just want something that tastes like the chocolate bars of your childhood. What sweet treats have you eaten lately? P.S. I’m going to be in Seattle this weekend/next week on a work trip (and visit with my brother) – if you’ve got recommendations for things to do or places to eat, send ’em my way!